I was sad to see that they were out of brioche or macarons, but we managed to get one small chocolate mousse cake and one small chocolate ganache cake for $5 each. The chocolate mousse cake was so light and creamy. As soon as I put the cake in my mouth, the mousse dissolved gently on my tongue, creating a mouthful of delicious chocolate air. 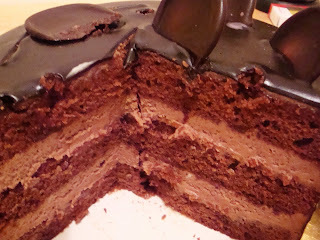 The ganache cake was a little more dense, but it had the perfect harmony of bitter and sweet. The cakes were on the smaller side, but each had such complex yet subtle flavor and textures that they satisfied every part of our senses. 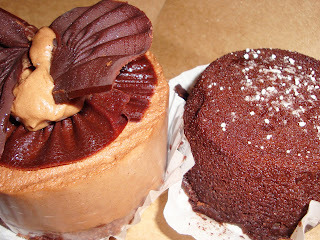 I enjoyed their cakes so much that RB got their chocolate fudge cake for my birthday a few days later! The amazingly moist sponges sandwiched two layers of chocolate mousse, but it was never too sweet. Oh, I could never have enough French cakes and pastries. What should I try here next?